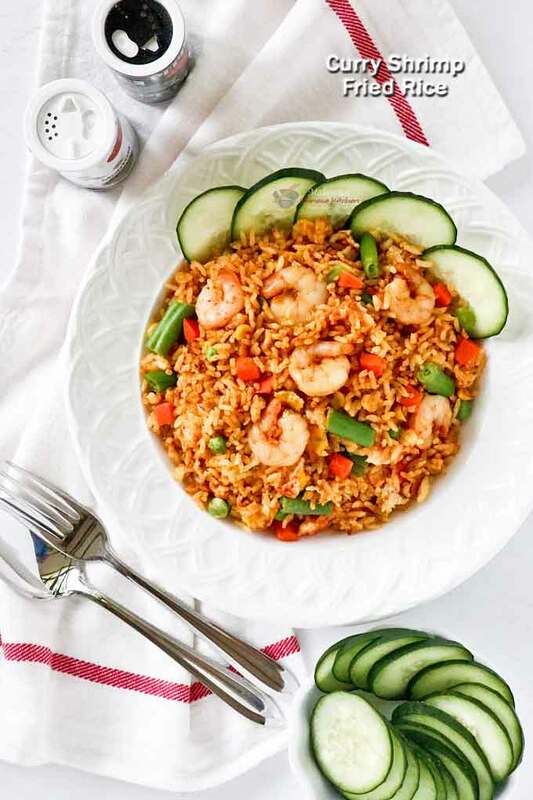 Quick and easy Curry Shrimp Fried Rice with egg and mixed vegetables. 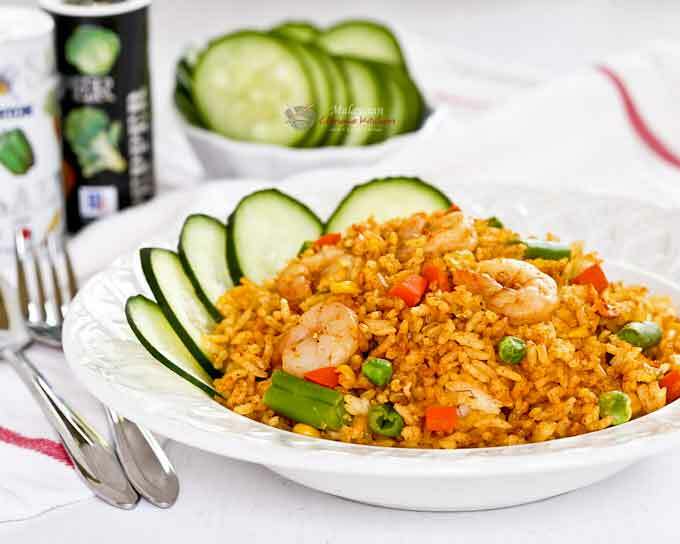 This curried flavored fried rice is so tasty and takes only 15 minutes to prepare. Hi everyone! It’s me, Jon. I know it has been a while but I have been busy with my final exams and all. The good thing is now I get to stay home for 3 weeks to enjoy the holidays before going back to campus for my final semester…woohoo! It truly is a wonderful time of the year with my little brother home as well and Dad taking time off from work. Christmas came and went. We had a lovely celebration with some friends coming over mid week. Even though it is really, really cold outside, it is warm and fuzzy inside with lots of good food and holiday cheer. Nobody wanted to be outside anyway and this cold front is supposed to continue until the end of next week…brrr! 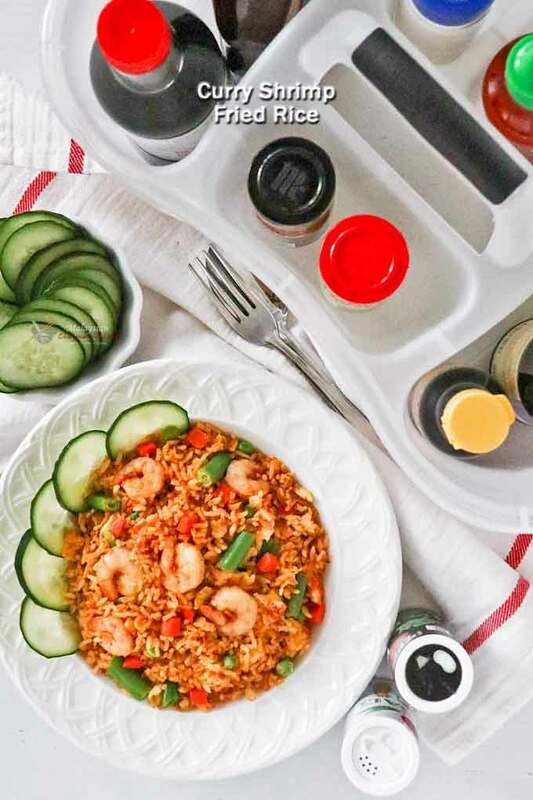 The best part of this Curry Shrimp Fried Rice is that it is really easy to prepare. There is no need to blend any spices. Simply sprinkled a tablespoon of curry powder onto the shrimps while they are cooking in the pan. One tablespoon of curry powder is sufficient to coat and flavor 2 cups of cooked rice. Very easy and quite tasty! In a large non-stick fry pan, heat vegetable oil. Fry garlic for about 30 seconds. Add shrimps and curry powder. Stir fry for 1 minute. Add frozen mixed vegetables in one corner of pan and egg in another corner. Break the egg yolk with a spatula. Then add cooked rice and salt and pepper to taste. Stir to get everything well mixed and continue to cook until rice is dry and fluffy. This will take about 3 minutes. 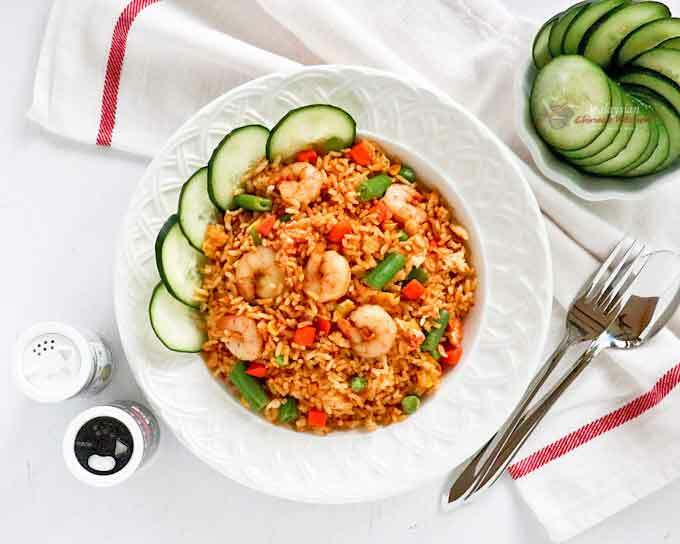 Thin slices of cucumber are a nice counterpoint to this Curry Shrimp Fried Rice. It is optional but highly recommended. Enjoy! Linda is a food writer and photographer who hails from Kuala Lumpur, Malaysia. She now lives in Colorado, USA. Her other blogs are Roti n Rice and Tea Tattler. Malaysian Chinese Kitchen is a participant in the Amazon Services LLC Associates Program, an affiliate advertising program designed to provide a means for sites to earn advertising fees by advertising and linking to Amazon.com. Thank you for sharing the recipe. The rice is so nice. 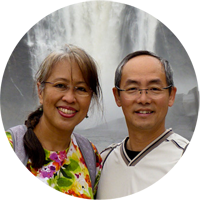 Linda and Paul inviting you to discover the world of Malaysian Chinese cuisine.